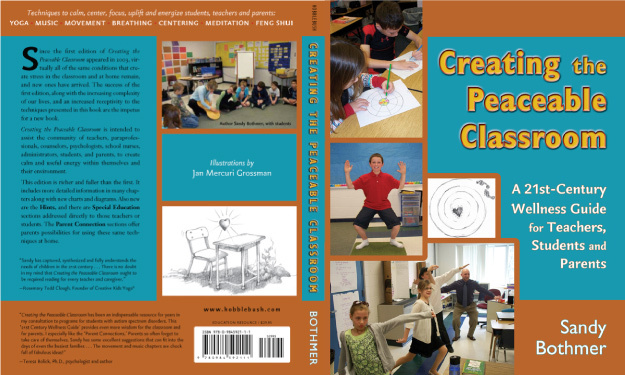 Creating the Peaceable Classroom Book The new Creating the Peaceable Classroom is here! Though the framework of the new edition is the same, three parts addressing the classroom space, the teacher and the student, this edition has been expanded. It’s richer and fuller than the first. It includes more detailed exercises and activities in many chapters along with new charts and diagrams. Also new are Hints, and Special Education sections addressed directly to those teachers and students. The Parent Connection sections offer parents possibilities for using these same techniques at home. Creating the Peaceable Classroom is intended to assist the community of teachers, paraprofessionals, counselors, psychologists, school nurses, administrators, students, and parents in creating calm and vitality within themselves and their environment for better teaching, learning, and living. It’s a wellness guide for the 21st century. NOW AVAILABLE! This one-of-a-kind collection of songs is ready to help your children or students change their state-of-being when needed with easy and effective mudras, hand gestures, that come from the practice of yoga. The hand placements are taught through songs that have been set to music that expresses the benefit derived from each mudra. The adults working with the kids can model the mudra along with the song, offering a visual cue. Holding time will vary depending upon age: a few breaths or seconds for younger kids and up to five minutes for adults. If the kids you are working with feel uncomfortable or light headed when holding the mudra, have them stop, sit quietly, and breathe deeply. Adults working with them should note the following contraindications: Uplifting Mudra #1, Courage Mudra #2 – HBP monitor it’s effects, Turtle Mudra #6 – LBP use carefully, all others no contraindication. TO LISTEN TO PREVIEW CLIPS OF THE ALBUM AND TO PURCHASE ALBUM DOWNLOADS, USE THE PLAYER BELOW. ENJOY THE ENTIRE SONG, HAPPY TO BE ME, ON TRACK 4. PHYSICAL Add the CD version to your collection. In the album booklet, you’ll find. • Photo of each mudra. Mudras can become a handy, self-regulation tool for your children or students and for you too because your hands are always with you!